Metal detecting in Caister on Sea in 1977 discovered a Late Bronze Age hoard. An NAU excavation carried out in 1986 revealed Roman pits and ditches which were part of the civilian settlement or vicus which surrounded the nearby Roman fort (NHER 8675). A Roman coin hoard has been found on the site, as well as other Roman coins, pottery, brooches and other metal finds. Finds dating from the prehistoric period and the Middle Saxon to the post medieval periods have also been recovered. Excavation in 1999 recorded a ditch of probable Bronze Age date and an isolated post-hole of prehistoric date. A deposit of topsoil washed into a depression contained large amounts of worked flint and pottery sherds of Middle and Late Saxon, medieval and post-medieval date. Site officially in Caister on Sea parish as from 1986. A copper alloy seal matrix was recovered. H. Hamilton (NLA), 20 May 2008. June 1977. Excavation. Caister Bypass. A trench was excavated west of the track now cut by the bypass in order to locate the Roman road thought to run west from the town (NHER 8675). No evidence of the Roman road was found, but several post medieval clay pits were recorded. It is presumed that the whole area had been disturbed by the clay pits. H. Hamilton (NLA), 19 May 2008. September 1977. Metal detecting. Caister Bypass. 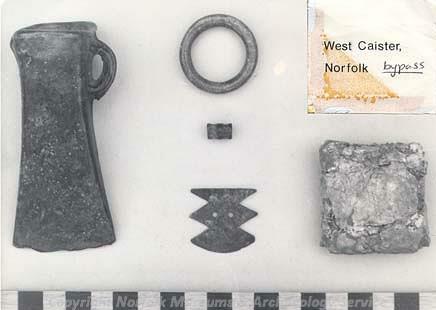 A Late Bronze Age hoard consisting of a socketed axe, a baluster bead, a hollow ring, a decorative comb-shaped plate, and two pieces of lead was recoverd by . The hoard has been dated to the 8th or 7th century BC and has Carp's Tongue affinities. Only one other cast bead is known from this period and there are no known parallels for the lead piece. See (S1-S4) for further details. See (S15) in the Illustration Library. 1977 to 1978. Metal detecting and fieldwalking in advance of bypass work. Detecting by the Norfolk and Suffolk Metal-Detecting Society along the line of the Caister Bypass both before and during construction recorded finds ranging from the Bronze Age to the post medieval period. Finds included the Late Bronze Age hoard described above and a concentration of 23 Roman coins dated from the late 2nd to the late 4th century AD as well as one Saxon, three medieval and seven post medieval coins, large numbers of post medieval copper coins and tokens, and other post medieval domestic and agricultural items. Finds dated to the medieval period include two seal-dies (S5), and a seal matrix of a French knight. See (S14, S16 and S17) in the Illustration Library. Aerial photograph record of ring ditch and linear features. Full details and plans in file. Five Roman coins and four sherds of Roman pottery were recovered along with one sherd of Ipswich ware, a Late Saxon Thetford-type rim sherd, a Late Saxon brooch, medieval pottery and coins, two 14th century circular seals (S5), a 13th century circular stock seal, a medieval book clasp, and post medieval coins, tokens, jettons, and pottery. See (S18, S19, S20, S21, S22, S23, S24, S25, S26, S2, S28 and S29) in the Illustration Library. Finds included a Neolithic or Bronze Age retouched flake, Roman coins and brooch, S30, Medieval coins and pottery, and post medieval buckles. 1980. Found with metal detecting. Middle Saxon and Roman pottery. Early to mid 1980's. Casual find. An almost complete 3rd to 4th century Nene Valley colourcoated ware dish was recovered during construction of . A flint waste flake, a flint borer, Roman coins, a Saxon openwork mount (S31), medieval pottery and coins, a medieval lead mortuary cross, a medieval gold finger ring, and other medieval metal items were recovered. Excavation of roadside trenches was observed by M. Darling. No archaeological finds or features were observed. September 1984. Metal detecting at . A copper alloy Hod Hill brooch was recovered. March 1986. Metal detecting at . A Roman coin was recovered. July 1986. Excavation on Roman site, 'Tessera Park'. Excavation of five trial trenches recorded several features within the concentration of surface finds spreading west from the fort (NHER 8675), including clay-lined pits, post holes, ditches, and gullies. Finds included several flint flakes, a retouched flake, a scraper, a few sherds of Prehistoric pottery (likely pre-Iron Age), one probably Iron Age pottery sherd, large quantities of tile (primarily tegulae and imbrices), and pottery from the late 2nd to early to mid 4th century. A pair of hob-nailed shoes (S7), two 4th century coins, and an inscribed copper alloy plaque were also recovered. The plaque was recovered from a large depression containing 3rd to 4th century pottery (S6). It was hoped that the east-west road leading to the west gate would be located in one of the trenches. Two shallow ditches were located in this trench, but they did not appear to be related to a road and no traces of metalling were observed. The ditches likely relate to cropmarks (see NHER 27513 and NHER 27397) to the west of the trench. The road may actually be represented by linear cropmarks running west south-west of the fort with a branch to the north-west. See (S2), (S6) and (S7) for further details. October to November 1987. Metal detecting at . Three medieval coins were recovered. These were found quite close together and may represent part of a hoard or a dropped purse. Winter 1987-88. Metal detecting at . A Roman miniature votive axe and a square of Roman bricks were found during building work. There were likely three bricks on each side, laid flat on natural sand. Two of the bricks have a double-horseshoe signature. June to August 1988. Finds made during bypass construction. Two struck flints (flake and core trimming). One sherd glazed red earthenware. 1989. Observation  and metal detecting . Several trenches were excavated by a builder. No archaeological finds or features were observed. However, metal detecting recovered one jetton. October 1992. Metal detecting. Context 563. A 4th century Roman coin was recovered. W. Milligan (NCM), 28 October 1992. Bronze large headed nail ?medieval. Half a 16th century copper alloy buckle. Identified S. Margeson (NCM), 4 November 1993. W. Milligan (NCM), 8 November 1993. January to March 1997. Fieldwalking and metal detecting. Bacton to Great Yarmouth pipeline. Field/Location RDX 36.1 (Context 100). Eight worked flint fragments including a core, a scraper, flakes and retouched flakes were recovered along with medieval and post medieval pottery and ceramic building material. See (S8) for further details. July 1998. Noted on aerial photographs (S9) X-Y by Gary Trimble (NAU). Cropmark of enclosure with radiussed corners and the right shape and size for a Roman marching camp. Followed by field boundaries on Ordnance Survey. Derek Edwards (NLA) is highly sceptical. D. Gurney (NLA) 3 July 1998. THESE CROPMARKS ARE NOW RECORDED AS NHER 27513 AND NHER 27397. November 1998. Fieldwalking. Bacton to Great Yarmouth pipeline. Field/Location RDX 36.1. Site 12. The route of the pipeline was re-aligned through this field and the new area was walked. Worked flint was recovered from all but two of the collection units. The assemblage consists of 54 flakes, a blade, a hammerstone, and two hammer flakes and largely dates to the Late Neolithic to Early Bronze Age, although the blade may be earlier. Only 8 burnt flint fragments were recovered, and no collection units produced more than one fragment. Other finds include one sherd Roman pottery, one sherd Ipswich-type ware, 17 sherds medieval pottery (8 glazed), 28 sherds post medieval pottery, and medieval to post medieval ceramic building material. H. Hamilton (NLA), 03 June 2008. March - May 1999. Excavation. Bacton to Great Yarmouth Pipeline Site 12. A well-defined post-hole was excavated containing nine sherds one from a sessel of Middle Bronze Age date and two pieces of daub. A ditch running north-south lengthways across the site contained pottery of indeterminate prehistoric date although it may be residual. A flint flake was recovered from a ditch and the slightly stepped profile could indicate that it was recut. An undated elongated oval feature was either a pit or natural feature. A north-south ditch was cut by one aligned east-west and was dated to the medieval period by finds. In the northern area of the site subsoil has washed into a large depression and contained struck flints including retouched pieces and pottery of Middle Saxon to Late Saxon, medieval and post-medieval date. See (S13) for further details. S. Howard (NLA), 4 February 2010. Cropmarks previously recorded under this NHER number are now included in the larger cropmark complex NHER 27513, NHER 27397 and a ring ditch is recorded as NHER 27395. --- Article in monograph: Thomas, G.. 2001. Strap-ends and the Identification of Regional Patterns in the Production and Circulation of Ornamental Metalwork in Late Anglo-Saxon and Viking-Age Britain.. Pattern and Purpose in Insular Art. Redknap, M. et al.. 39-48, fig 4.3b. <S1> Unpublished document: Lawson, A.. 1978. Archaeological Work on the Caister-on-Sea Bypass. 13 March. <S2> Monograph: Darling, M.J. and Gurney, D.. 1993. Caister-on-Sea Excavations by Charles Green 1951-55.. East Anglian Archaeology. Vol 60. pp 42-43, appendix 6. <S3> Unpublished document: Report on Late Bronze Age hoard, Caister-on-Sea Bypass. <S4> Monograph: Lawson, A.. 1979. A Bronze Age Hoard from West Caister, Norfolk.. British Archaeological Report British Series. Vol 67, pp 173-80. pp 173-80. <S5> Article in serial: Margeson, S. 1985. 14th-century Seal-Dies from Norfolk. Norfolk Archaeology. Vol XXXIX Pt II pp 218-220. p 220, pl VI-VII. <S6> Article in serial: Hassall, M.W.C. & Tomlin, R.S.. 1988. Roman Britain in 1987. Inscriptions.. Britannia. Vol XIX, pp 485-508. p 485. <S7> Newspaper Article: 1986. Eastern Daily Press. 3 July. <S8> Unpublished document: Crowson, A. (NAU). 1997. NAU Report No. 262. Bacton to Great Yarmouth Power Station Pipeline Archaeological Fieldwalking Survey.. RDX 36.1. <S9> Aerial Photograph: TG5112 P-AHJ; TG5111 B-E.
<S10> Unpublished document: Crowson, A.. 1998. NAU Report No. 362. Bacton to Great Yarmouth Power Station Pipeline Archaeological Fieldwalking Survey Part II.. November. Site 12 (RDX 36.1). <S11> Unpublished document: Bates, S. and Crowson, A.. 2004. NAU Report No. 924. Assessment Report and Updated Project Design for Archaeological Excavations and Watching Brief on the Bacton to Great Yarmouth Gas Pipeline, Norfolk.. pp. 18-19. <S13> Unpublished document: Bates, S.. 2008. NAU Archaeology Report. Archaeological work on the line of the Bacton to Great Yarmouth Gas Pipeline, Norfolk, 1997-99.. Site 12, pp 60-62. <S14> Illustration: Gregory, T.. 1978. Drawing of a Roman copper alloy brooch fragment.. Card. 2:1. <S15> Illustration: Lawson, A. 1977. Drawings of a range of a Bronze Age hoard found in 1977, Caister on Sea.. Paper. 1:1. <S16> Illustration: Gregory, T.. 1978. Drawing of a Roman thistle brooch foot fragment.. Card. 1:1. <S17> Illustration: Gregory, T.. 1978. Drawing of a Late Bronze Age socketed axe fragment.. Card. 1:1. <S18> Illustration: Unknown. 1981. Drawing of an Undated copper alloy ring.. Card. 1:1. <S19> Illustration: Unknown. 1981. Drawing of a post-medieval copper alloy pottery fitting.. Card. 2:1. <S20> Illustration: Unknown. 1981. Drawing of a medieval bar possible bridle-bar.. Card. 1:1. <S21> Illustration: Unknown. 1981. Drawing of a medieval book clasp fragment.. Card. 2:1. <S22> Illustration: Unknown. 1981. Drawing of a post-medieval copper alloy strap fitting.. Card. Unknown. <S23> Illustration: Unknown. 1981. Drawing of a post-medieval copper alloy nail.. Card. 2:1. <S24> Illustration: Unknown. 1981. Drawing of a post-medieval copper alloy cylindrical handle.. Card. 2:1. <S25> Illustration: Unknown. 1981. Drawing of a post-medieval handle or a plumb-bob.. Card. Unknown. <S26> Illustration: Unknown. 1981. Drawing of a post-medieval copper alloy hooked plate.. Card. 2:1. <S27> Illustration: Unknown. 1981. Drawing of a Late Saxon Bronze disc brooch.. Card. 1:1. <S28> Illustration: Unknown. 1981. Drawing of a medieval copepr alloy stud.. Card. 2:1. <S29> Illustration: Unknown. 1981. Drawing of a medieval copper alloy mount.. Card. 2:1. <S30> Illustration: Unknown. 1981. Drawing of a Roman trumpet brooch fragment.. Card. 2:1. <S31> Illustration: White, S.. 1980. Drawing of a Saxon copper alloy openwork mount.. Card. 2:1.